The American Veterinary Medical Association (AVMA) Executive Board approved revisions to the new 2011 Model Veterinary Practice Act (MVPA) in November 2011, and those changes became official on January 7, 2012 when the AVMA's governing body, the House of Delegates, approved the document. The Model Veterinary Practice Act is just that: an approved sample ("model") document that is promoted by the AVMA as reflecting the verbiage and policies it would like to see adopted in each of the 50 states as the ideal state veterinary practice act. That said, each state can and probably will make some changes; the states usually end up with documents that vary on some level related to how veterinary practice is conducted or regulated. Each time the MVPA is changed, the AVMA opens a comment period for members and the public to have their say. That period has now passed. The AVMA reported that it received "985 comments on individual sections of the model act. About 70% of the comments were submitted by non-members, and 10% came from organizations as opposed to individuals. The sections attracting the most comments are Section 2 (definitions, especially “complementary, alternative and integrative therapies” and “practice of veterinary medicine”), Section 6 (exemptions to the act), the preamble (general comments) and Section 3 (board of veterinary medicine)." While horseshoeing had been previously excluded from practicing veterinary medicine, this year's edits (Section 6. Number 8) showed a line drawn through the word "horseshoeing". It was changed to "farriery". The exemption now reads "Any person lawfully engaged in the art or profession of farriery." No explanation is given for the change, and while other words are defined, "farriery" is not. Although other professions, such as pharmacists and researchers, are also listed as exempt, farriers are one of only a few professions predicated by "lawfully engaged". And it is the only one described as an "art or profession". Since farriery and other hoof-related professions are not regulated in the United States except on racetracks, the language begs the question of how it would be determined whether or not an individual was lawfully engaged in providing farriery care to an animal. And what, exactly, farriery is. The word change in the horseshoeing--or farriery--section is probably a minor matter in the big picture of things, but it should be duly noted. "Horseshoeing" is the word traditionally used in all US government documents; farriery is seldom mentioned. The word seems to have been dusted off, perhaps around the time of the formation of the American Farrier's Association and it has enjoyed a renaissance, particularly in the past 30 years or so. That said, it remains poorly defined and some hoof-oriented professionals simply don't like the word, while others prefer it. You can call yourself whatever you please--except a veterinarian, unless you are one. The general public, however, is behind the curve; people are usually convinced that a farrier either makes fur coats or carries people back and forth across rivers in a boat. They think "farrier" is a great word for "Words with Friends" on their iPhones. Repeated calls and emails to the AVMA and its task force administrators were not acknowledged or returned except for one interchange with a media relations representative who referred me to the librarian. 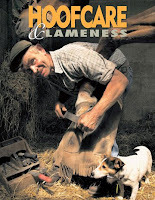 I did enjoy my conversation with Diane Fagen, AVMA librarian, who set out to find out if a farrier was defined anywhere by the association. Being a good librarian, she cheerfully suggested we look up farrier in the ultimate reference, the Oxford English Dictionary. I warned her not to, and that attorneys roll their eyes at OED definitions, but she did anyway. "Oh my," Ms Fagen murmured, reading aloud a lengthy definition of the term "farrier" that seems woefully outdated, though historically accurate. "It means horse doctor," she concluded. "I can see why you called," she acknowledged. But no, she didn't have any information on why the word had been changed. But that's how change happens, sometimes: it just does. According to the new farrier organization, American Association of Professional Farriers, it seems the trend in the hoof care industry is to consider farriery "A Balance of Art and Science", and having nothing to do with specifically applying metal horseshoes (or horseshoes of any kind). Most of the "Barefoot Only" professional organizations are even allowing shoers of some kind. The lines are being blurred! Whether the terminology is ill defined or not, it seems the trend all around is to go to a more broadly applicable term for someone who's purview is the care of the horse's foot! Sure, Daisy, you can define any word any way you'd like. The point of my article is to ask how the AVMA and a court of law define the word. That's all that counts in a legal situation. Am I understanding this ? If a the legal definition will be based on Oxford's Dictionary, does that mean horse doctoring will be exempt ? No, Rocky Studios. Please read the article carefully. First of all, the MVP is a model document, a framework. It is not a law. It is a suggestion of what the AVMA would like states to adopt as their law. As an aside, the librarian looked farriery up in in the Oxford English Dictionary and marveled that the word had a complex meaning that was equated with "horse doctor". That was merely an observation. The problem is that farriery is not defined by the AVMA in the text of the MVP, although many other terms are. That was my point and my only point: the word was changed and the new word was not defined. Hopefully if states adopt this MVP, they will clarify that line. I wanted the hoofcare community to be aware of this change.